Naturalization ceremonies, federal court proceedings that do not involve litigants and lawyers, are held once or twice a year in each of the Eastern District of Tennessee courts. One of the more notable speakers at one of these ceremonies was award-winning author Alex Haley, now deceased, who spoke at a naturalization ceremony held in Knoxville on March 13, 1991, presided over by Judge Jarvis. Mr. Haley’s speech was reported for the court records by U.S. District Court reporter Jolene Owen, who was instrumental in conveying to Mr. Haley the invitation to speak at the ceremony. In her off-duty hours, she reported and transcribed an event that took place at his Anderson County farm and volunteered to ask him to speak at the ceremony. The Court Historical Society has in its archives a copy of the program that he autographed and inscribed with the words “Brotherly Love!” The opening portion of Mr. Haley’s talk appears below. 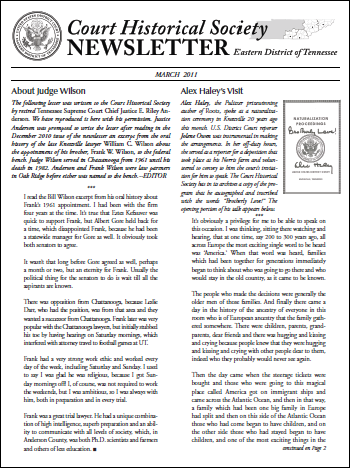 The Court Historical Society was formed in 1993 and adopted the mission of compiling and preserving the history of the United States District Court for the Eastern District of Tennessee. The Society has approximately 200 members throughout the Eastern District, mainly lawyers who practice in this court, but membership is open to all who have an interest in the Society’s work. The Society has compiled numerous oral histories; it has collected artifacts related to the court’s work, and several of these are on display in each division; and it commissioned the writing of the court’s history, which has been published in a book titled Justice in the Valley. It’s obviously a privilege for me to be able to speak on this occasion. I was thinking, sitting there watching and hearing, that at one time, say 200–300 years ago, all across Europe the most exciting single word to be heard was America. When that word was heard, families which had been together for generations immediately began to think about who was going to go there and who would stay in the old country as it came to be known. The people who made the decisions were generally the older men of those families. And finally there came a day in the history of the ancestry of everyone in this room who is of European ancestry that the family gathered somewhere. There were children, parents, grandparents, dear friends and there was hugging and kissing and crying, because people knew that they were hugging and kissing and crying with other people dear to them, indeed who they probably would never see again. Then the day came when the steerage tickets were bought and those who were going to this magical place called America got on immigrant ships and came across the Atlantic Ocean, and then in that way, a family which had been one big family in Europe had split, and then on this side of the Atlantic Ocean those who had come began to have children, and on the other side, those who had stayed began to have children, and one of the most exciting things in the field of genealogy or family searching today is how, in this country, virtually everybody who is of the European ancestry has anywhere from dozens to scores of literal blood cousins somewhere in Europe who don’t even know the cousins on this side, and likewise the cousins on this side don’t know who the ones over there are. So the big exciting thing now in genealogy is trying to bring together the families which were split 100, 150, 200 years ago by the magic of that word America. ~ Alex Haley.